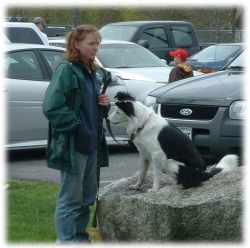 "The Flyball MAINEiacs were started because of my flyball addiction. I started playing flyball with my Labrador Retriever, Bullet, in 1996 with New River Express from Virginia. Six years later, I find myself with a border collie (who loves ball) in Minnesota, so decided to try her at flyball. Sally loved it so much that I had to try to start a team after I moved to Bar Harbor, Maine in January of 2004. 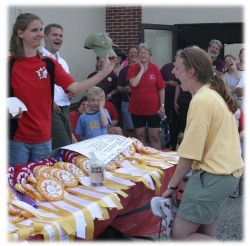 The Flyball MAINEiacs formed in April, 2004. The first brave people and dogs to join us were Karen and Dave Davis with Eartha, Gene Nardi with Susie and Barb and Gary Simons who loaned Shrek to us. These were the first dogs to enter a tournament with us and thus the charter members of the Flyball MAINEiacs. The first tournament we entered was New England Trailblazer's in May 2004. We went primarily for the experience for the new people and dogs and learned a lot. By the July tournament we were ready to run for real and since then have been having a lot of fun. We have come a long way in a few short months, but could not have done it without the help of our friend teams: Happy Hurdlers (Sally's former team) and RAID from Minnesota, All Ruffed Up from Iowa, New River Express from Virginia, and the New England/Region 13 teams who have been so supportive of us here. People from around here have helped me with demos, let us borrow a dog, helped new handlers, boxloaded, handled my dog and have been very kind to us." SEAL HARBOR - Monica C. Roberts PhD, 30, died unexpectedly Tuesday, Aug. 15, 2006, at a Bangor hospital. She was a research scientist at The Jackson Laboratory. She graduated from Virginia Tech with a Bachelor of Science degree in biology and animal sciences, in 1998. She received a doctorate in molecular biology from the University of Minnesota at St. Paul in 2003 and completed two years of post-doctorate study at The Jackson Laboratory. She was currently employed at The Jackson Laboratory, in technical support. 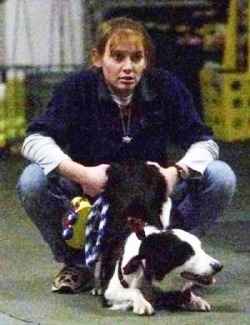 She founded the "Flyball Maineiacs" flyball team in 2004, and remained active in its operation and promotion until her death. Dr. Roberts is survived by her parents, Wayne and Carole Roberts of Chatham, Va.; a brother, Matthew E. Roberts and his wife, Christine, of Richmond, Va.; and her paternal grandmother, Blanche P. Roberts of Lewistown, Pa. A memorial service to celebrate her life will be held 10 a.m. Saturday, Aug. 19, on the lawn at The Jordan Pond House. Friends, including her beloved canine friends, are invited to join her family. An interment ceremony for the extended family will be held at Holy Innocents Episcopal Church Memorial Garden, Beach Haven, N.J., at a later date.